New York City is the city of skyscrapers – and there are more on the way. Defined by iconic Art Deco towers of the 1930s and modern glass behemoths, New York's skyline is full of history and modernity. 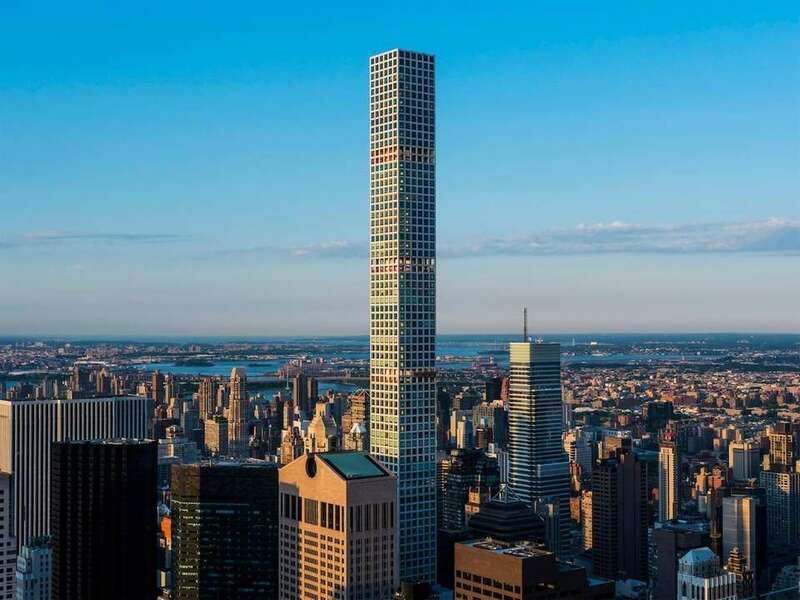 Take a look at the 13 tallest buildings in New York City. 1 World Trade Center stands at 1,776 feet, making it the tallest building in the Western Hemisphere. The 104-story building opened in October 2014 and offers 3 million square feet of rentable space. The building's observatory, which opened in 2015, rises 1,250 feet above the ground, offering sweeping views of New York City and beyond. The tower at 432 Park Ave. topped out at 1,396 feet on Oct. 14, 2014, making it the tallest residential building in the Western Hemisphere. At that height, 432 Park Ave. is now taller than the Empire State Building and taller than One World Trade Center without its spire. 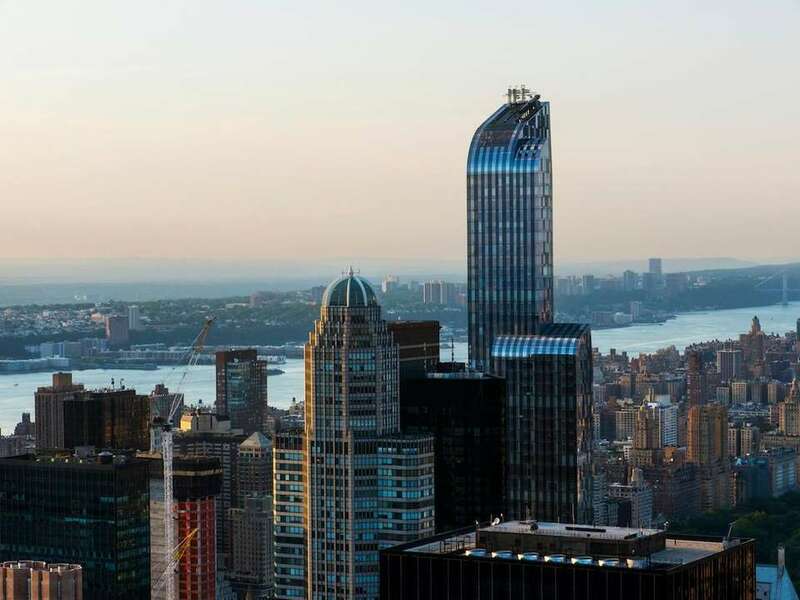 The cornerstone of the city's new "Billionaire's Row," 432 Park Ave.'s most expensive apartment, one of the penthouses, was once for sale for $95 million. Currently, available apartments range in price from $5.95 million to a $82 million penthouse, according to the real estate listing website StreetEasy. The iconic Empire State Building, located at 350 Fifth Ave. between 33rd and 34th streets, is 1,250 feet high. When it was completed in 1931, the Empire State Building was the tallest building not just in New York, but in the world. It kept the title until 1973, when the World Trade Center was completed. The Empire State Building once again became the tallest building in New York on Sept. 11, 2001, when the Twin Towers fell. The Bank of America Tower, center, stands at 1,200 feet. The building, located on Sixth Avenue between 42nd and 43 streets, earned U.S. Green Building Council's LEED Core & Shell Platinum certification as one of the world's most environmentally responsible high-rise office buildings, according to Bank of America. It was the first skyscraper to receive the designation. Three World Trade Center, which officially opened on Monday, clocks in at 1,079 feet, making it the fifth tallest building in the city. The building is mostly for commercial use, but there is some retail space on the lower floors. Chief architect Richard Paul said 3 World Trade Center was created in a way that compliments the Oculus, National September 11 Memorial and other towers on the revamped World Trade Center site. The Chrysler Building, located at 405 Lexington Ave., is 1,046 feet tall. When it opened in 1930, it was the tallest building in the world -- but it only had the title for 11 months, when the Empire State Building was completed. It is now considered tied with The New York Times Building as the sixth tallest in the city. Located at 242 W. 41st St., on the corner of Eighth Avenue, The New York Times Building is 1,046 feet tall. It's the same height as the Chrysler Building, tying for sixth tallest in New York now that 3 World Trade Center has taken over the slot for fifth tallest. The New York Times Building is the first high-rise curtain wall with ceramic sunscreen built in the U.S., according to The New York Times. Since it topped out in June 2012, One57 and neighboring 432 Park Ave. have changed the skyline along Central Park South. The 90-story, 1,004-foot-tall building is mixed-use; the bottom 25 floors are part of the Park Hyatt hotel and the rest are residential condominiums. Designed by Pritzker Architecture Prize winner Fumihiko Maki, 4 World Trade Center, located at 150 Greenwich St., is 977 feet tall. The first of the new World Trade Center to be completed (and once known as "New York's most ignored skyscraper" by The New York Times), 4 World Trade Center opened in November 2013. At 952 feet, 70 Pine St. debuted in 1932. The Art Deco skyscraper was once the third tallest building in the city, behind only the Empire State Building and the Chrysler Building. After decades of being shuttered, the building was reopened in 2015 with rental units currently ranging in price from $3,351 a month to a $10,274 penthouse, according to StreetEasy. The building features an artisanal coffee shop, fitness center and a full-service market, among other amenities. 40 Wall St., also known as The Trump Building, is 927 feet tall. When it was completed in 1930, it was the tallest building in the world (an honor soon lost to the Chrysler Building and then the Empire State Building), surpassing the Woolworth Building. In the 1980s, 40 Wall St. was one of the properties secretly purchased by Philippine President Ferdinand Marcos, and a court battle over ownership lasted for years after his ouster. Donald Trump, before his presidency, bought the skyscraper at a famously low price in 1995 after it had fallen into disrepair. He put a reported $35 million into repairs and renamed it The Trump Building. Towering at 926 feet, 30 Park Place plays host to both a Four Seasons hotel and private residences. Located in TriBeCa, it is the tallest downtown residential tower, according to the building's website. The building, owned by Silverstein Properties and designed by Robert A.M. Stern, offers sweeping views of New York City and ample amenities for its guests and residents, including a 75-foot pool, fitness center and a vaulted, double-height conservatory. Completed in 1977, the Citicorp Center (later renamed the Citigroup Center and now known as 601 Lexington Ave.) is 915 feet tall. It was the first skyscraper in the U.S. to be built with a tuned mass damper, which reduces the sway in tall buildings.